No Check (default) - duplicate submissions will not be checked in this state. Check cookies and IP - Aside from cookies, it also checks if the submission came from the same IP address. If you select Strict Check, people in the same network (in the same school, college, university, institution) will not be able to make submissions, as the IP address for the network would be the same. If you are considering the target audience as students in the same school, Loose Check should be chosen. 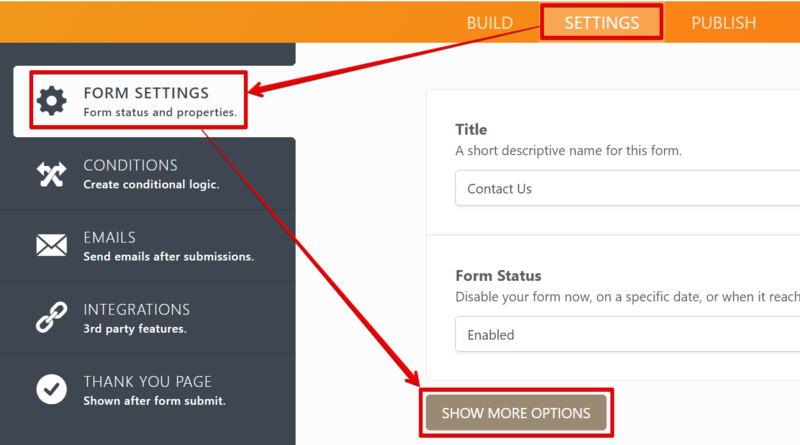 The instructions below shows how you can access Unique Submission through the form's builder page. Step 2: Look for Unique Submission and select an option from the drop-down. Step 3: After selecting an option, notice at the top of the builder page (below the Form Title) that all changes have been saved. Is it possible to only allow one submission per email address? If I set the Unique Suhbmission to No check, will the CAPTCHA feature still work to protect my form? Yes, this worked but my form is used monthly. Is there a way to reset (delete the cookies) upon deleting each months submissions? So attendees can still sign up next month without being blocked. I tested this and when I deleted my submission and tried to sign up again I still was blocked. Getting it to clear cookies or reset on deletion would be a great help. Can you tell me what message comes up when they do submit a duplicate submission under "cookies only"? What happens? I am using my form for my online store website. What if i choose the "Check Cookies Only". Is this also a lifetime limit? I want to block the spammers but i also want my clients to purchase again using the same Purchase order form. Is it possible to direct the user to a "Sign Up" link when they get this error? recibo formularios duplicados al parecer los formulario se repiten cuando el usuario vuelve atras en su navegador. Hay forma de evitar esto? Ya intentamos agregar un captcha pero el problema continua. When using "loose check" is the cookie being used a "Session Cookie" (cleared when the browser is closed and reopened) or "Persistent Cookie"? If it's Persistent does it expire? When? Is there a way for people to submit updates to the information they've already submitted? Lets say today my cell phone number is 555-5555 but next week it changes. Can I go in and check a box or something that says "Update my previous information" or something? I have created a form. For some reason if I follow your answer as shown above. Under the preference button I have a "Form Limits" tab(This might be a new version from the one shown above). Under this tab the "Unique Submission" option is there but as I click on it to change it, it doesn't let me. Why is this? I want to reset it everyday . i want it to be done automatically????? This is great, BUT if you could trigger the email program to run when the next page button is pressed, then you could put in a box for the user to tick if they want the email, and set a conditional email to send when they press next, IF they tick that box. Better yet, if an email could send the moment they tick the box/ press a button that would be fantastic! My only other problem is that this assumes they're being sent direct Jotform links, many of your clients, myself included, embed your forms into their own websites and don't want the user to know they're using Jotform - this wouldn't work as it only works with a jotform link! Will they be able to come back the next day and submit the forma again? Or does it block them forever on strict? I'm a consultant and want to create forms to send to different users who can save their answers and return to see what they have answered from time to time as a saved formed unique to them so they can refer to it as an ongoing plan that gets adjusted as they go in time? Is there a way to change this message to a custom one? A previous form that I used had a strict check on any one of the fields of the form, does the loose check do this ? I have asked one of our users who has two email addresses to try a submission with the strict check and it of course blocks his submission from their other address, but when I set it to loose check they can send duplicate submission. Can you suggest that the strict check only checks for a specified duplicated field for example email address. Is there a way to customize the notification that multiple submissions are not allowed? I have the same requirement as yoyou12121 and bhanu. I want to limit submissions to approx 10 in a calendar month from one IP address. I have a same query as (yoyo12121). I have a similar requirement. Please help. What would be good is to have a unique submission method where a one time code is required for submission, and that code is barred from usage once used. For the users to submit the form, at the end, they will need to enter their respective code, ie. COde02. Once entered, the database will take note of it, and when attempted to enter again with that same code, it will not be allowed. Thanks. We permit different content from same person or email. But we like to prevent same title only. Does this cookie control or check the paper title only. It seems that if you choose a strict check, a form can only be submitted once from a particular IP address. With this decision, you are essentially blocking the IP address from submitting more than one form. So a person who wants to make fake submissions can only make 1 fake submission from a particular IP address. Then, they would have to use a proxy server or log in from another IP address. So it's impossible to stop a particular person from making multiple submissions. What would also be helpful would be 1. a way of identifying the MAC address and allowing only one submission per MAC, so that the user would have even more trouble making multiple submissions. 2. a way of preventing a person with a certain ID from submitting a particular form more than once. I am currently using your program for my reservation system and I keep having this one person sending "fake" emails. Is there a way to block out a specific IP address? please let me know. Is it possible to create a form and have people access it after submission to modify it? Can I Duplicate Conditions that I've Already Created?